BHSU edges School of Mines Saturday night. SPEARFISH, S.D. – Tyler Oliver hit a buzzer beating layup, as the Black Hills State University men's basketball team edged South Dakota School of Mines, 57-56, in overtime on Saturday evening. Oliver led the way for the Yellow Jackets (2-3, 1-0 RMAC), recording a double-double with 17 points and 10 rebounds. Connor O'Hearn had 11 points, and Patrick Mendes added 10. BHSU trailed by three points with less than 10 seconds in regulation. Dez Stoudamire grabbed an offensive rebound and threw up a three-pointer from the corner. The desperation shot found the net and went in just as the buzzer sounded, and forced overtime. In overtime, with the Yellow Jackets up one point, Logan Elers made a layup with less than 10 seconds to play to give South Dakota Mines (2-6, 0-1 RMAC) a one-point lead. However, the Hardrockers did not get back on defense following the make, and Oliver ran the floor, laying the ball in just before the buzzer to secure the rivalry game victory to start conference play. The game was wire-to-wire throughout all 45 minutes. SDM jumped out to a 6-0 lead, but the Yellow Jackets fought back to tie it up, 14-14, with just over five minutes to play in the half. The Hardrockers would lead, 23-22, at the break. South Dakota Mines started the second half on a 6-0 run, leading by a game-high seven points, 29-22. However, once again, the Yellow Jackets fought back, and eventually took a five-point lead of their own with 15 minutes to play. With just over 10 minutes remaining in regulation, the Hardrockers retook the lead, and eventually led by one point, 48-47, with under four minutes to play. A dunk by Mitchell Sueker put the home team up by three to set up Stoudamire's buzzer beating three which sent the game to overtime. BHSU shot 36.4 percent from the field (20-for-55), while SDM was 43.9 percent from the floor (25-for-57). 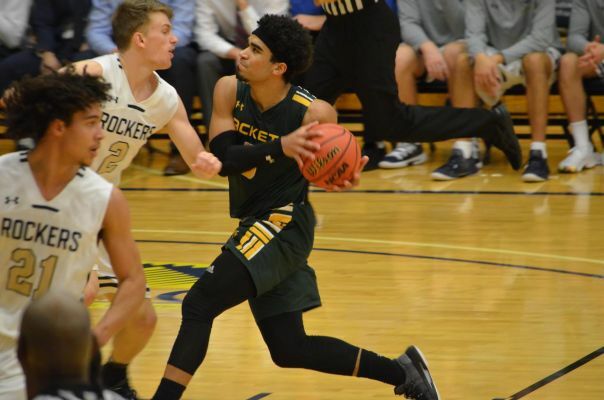 The Yellow Jackets were 2-for-19 (10.5 percent) from beyond the arc, while the Hardrockers were 2-for-16 (12.5 percent) on three-pointers. The Green and Gold outrebounded SDM, 36-27. Mitchell Sueker had 19 points to lead the Hardrockers. Logan Elers had 12, and Jake Heath added 10.